While we were in the area, I was able to get a jump on all things Cultivated Journey as G.R. was in class all day, every day. On the weekends we would get out to find markets, breweries & get to the ocean every chance we could. 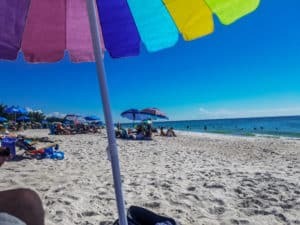 The main problem that kept us from spending more time at the actual beach during our stay this year was red tide … but, you can’t help mother nature! We went lots of places & I will do my best to highlight some that we would recommend. 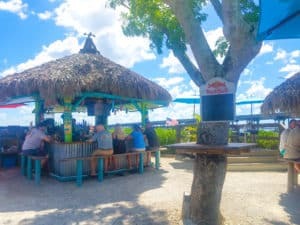 In Palmetto, one of the first places we went was The Sea Hut (Crab Trap) Restaurant. It is on (estuary, Terra Ceia Bay) water & not far from Terra Ceia RV Resort. The inside is nice – in a classic old school meets kitschy way, but it works because you feel endeared to it by the time you leave. We liked it & went several times while we were there. Seafood (crab especially) is king here. G.R. loved the blue crab quesadilla he got (they serve them ‘pizza style’) which means it like the best, crisp mini pizza. The spinach salad & clam chowder are worth having. I can also attest to their fried seafood as I ordered the Red Neck Platter one time (come on, I HAD to … we are from the mid-west!). It had catfish, frog legs & ‘gator. All of them were excellent. There is a farmer’s market by Demi’s Noodle House that is worth going to either after or before you hit Demi’s for GREAT Pho!! I was really missing our favorite Pho place in Kansas City, Viet Cafe, so I took a shot based on reviews & they were right! It was excellent. The farmers market was next door, so go on a Saturday & get both on your way to Emerson Point Preserve. The preserve is someplace you can spend all day so take your bike or wear your walking shoes & pack snacks/water. 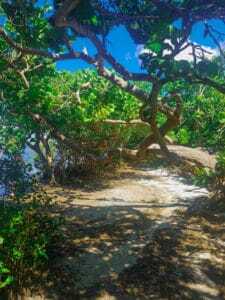 There are beach areas, hiking trails, bike area & (supposedly) alligators but we didn’t see any. For food (groceries), besides the farmers market I mentioned, there are a few more farmers markets in the area but if you can, check out Red Barn Flea Market on a weekend as they have a large farmers market at one end but also includes a flea market, plaza shops & food courts & even some live entertainment… it’s an experience. There’s a Publix (good for regular groceries & they DO deliver to Terra Ceia- so that was a “score”!) 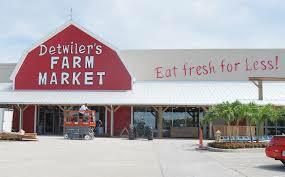 but there’s also Primo Market (full Hispanic market with a LOT of selection), Palmetto Meat Shop & Detwiler’s Farm Market. If you can only pick one of these three, go to Detwiler’s! They are a local (original one in Sarasota & there’s only 3 total …?) and as a point of reference it’s like a local farmer/fisherman-centric natural market. 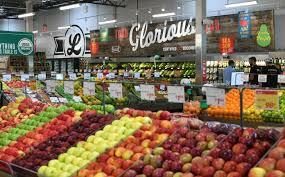 The interior (shelves) are more limited in brands (great is you are looking for dietary specific need items) But for the produce, dairy & meat – yes, I know, I am a broken record on the subject – they are awesome! We did not make it to Palmetto Meat Shop, but I heard rave reviews as well as read many more online …so, if any of you make it there, please tell me if it lives up to the hype! 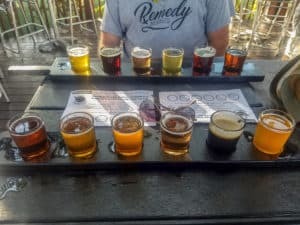 We hit two breweries while we were there that we would recommend. 3 Keys Brewing & Eatery was the first one we hit. We loved the fact that they have a kitchen & thus, a real menu. There is no fryer (meaning no fries, etc) but you don’t miss them & the burgers are great. Also, they have an entire wall covered with mugs for their Pints Club — awesome! We also went to Motorworks Brewing & loved it as well. 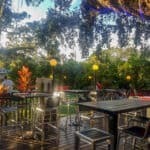 They have a HUGE outdoor area -you will love ‘the tree’ with lights & the outdoor game area is terrific plus a stage for bands which play weekly. 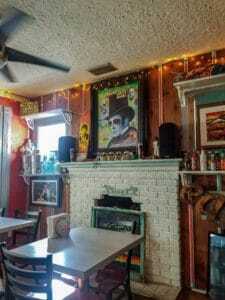 Before you go to Motorworks (or after) GO TO Birdrock Taco Shack. It is literally on the street just behind it in the art district. I can’t say enough about this Chef-owned, super artsy, eclectic (little) restaurant that has what they are doing, why & for whom DIALED IN! Just trust me & GO! The taco menu changes (because the Chef sources local AND is just creative like we Chef’s can be) but do order the Avocado Guac. it’s terrific! Tacos are life. My Alex would have been beside himself at this place! If you have a sunny day that you should be on the water, or maybe you even are on the water, go to Woody’s River Roo. You can get to it by land OR by boat. The food is outstanding, there’s music & cold drinks & water & sun … ‘nuff said! 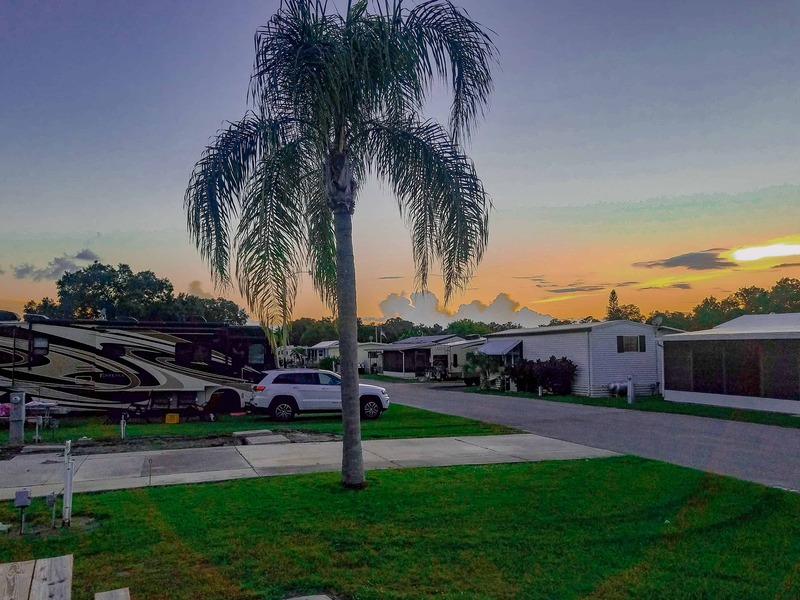 If for no other reason, go to Tampa just to visit Lazy Days RV! I mean “the world’s largest RV dealer … ” so, we had to go, right? It was awesome but plan to spend a day there. They shuttle you around (or I think you can rent your own) via golf cart because it is acres & acres of RV’s. We asked to be taken to the used Class A Diesel Pushers. The ride was at least 3-4 minutes (in a golf cart) just to get us there & then we called for a pick up. You would have walk 45 minutes to get back to the front. It’s an RV paradise! 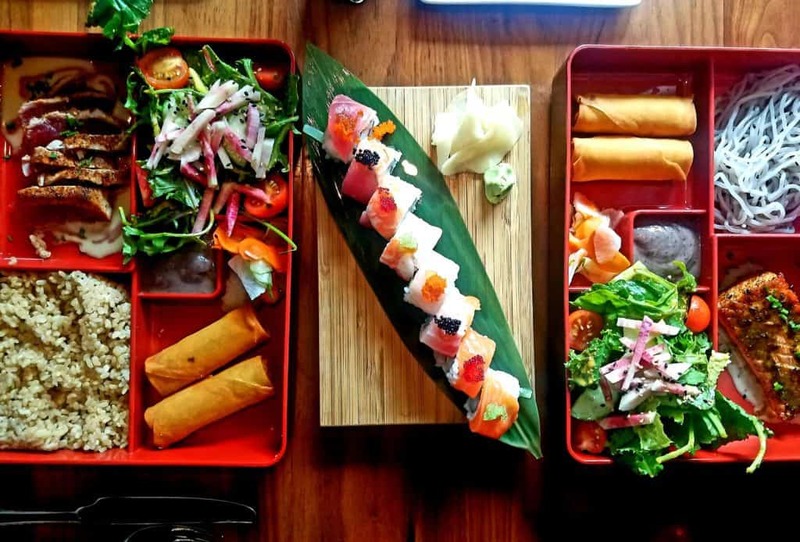 Bento boxes & sushi! Happy anniversary to us! While in Florida, we celebrated our one-year wedding anniversary (30 years & a few months after we started dating in college, but that’s another story). 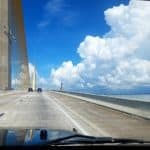 We drove across the majestic Sunshine Skyway Bridge to St. Petersburg & ate at Souzou (update, new owner, now Sake 23). They call themselves Asian fusion with sushi & craft cocktails. I absolutely love this type of place & it did not disappoint. We will spend more time in St. Petersburg next time we are in the area as there was a lot on our list that we didn’t get to there! We did make out it to Anna Maria Island . We started with donuts at The Donut Experiment, then took a walk on one side of the island & went back for J. Burns Pizza. It was really good. Then we went to the beach in front of the Sandbar Restaurant & hung out on the sand & in the surf for the day! We did eat at Sandbar later in the day. It’s good, but a little pricey. 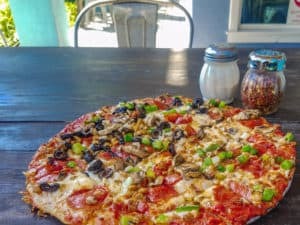 However, they sure do have prime real estate, so it was part of an the experience … but if you are on a budget, get pizza at J Burns to go & head to the beach!!! We kept meaning to get to Sarasota & the day that we finally went it was rainy & we got a late start. We chose to eat at a longtime (100 year) staple Walt’s Fish Market & Restaurant & if we lived there I would be a regular both at the restaurant AND the market. 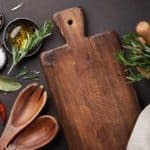 IF we could have we would have gone to these two craft breweries there– JDub’s offers a taproom, tours & food trucks &/OR Big Top Brewery which boasts a taproom & sometimes food trucks. Again, IF you go, let me know how they are!! We really enjoyed our time in the Palmetto area of Florida. We would love to pass through again someday, but for now, we have moved on. We have continued on to new adventures, delicious meals, some good brews & a lifetime of memories await!